We were more than a little fortunate to be in the Path of Totality in Lander for the Great American Eclipse 2017. The preparation was a group effort in all the communities throughout the country to pull off the 10s of 1000s of people that flooded in to small cities, and even smaller towns. I must admit it was work, and we wondered if the hype of a total solar eclipse was really all it was cut out to be. I have seen a partial eclipse, and I am sure I thought it was interesting, but was it memorable? To be honest I can’t remember. We heard about Eclipse Chasers, even met some. Folks that just have to see one more total solar eclipse, and then another. Really? Isn’t one enough? I was just excited I would get to experience one in my life time, and glad I wasn’t going to need to travel to see it. As people flooded in to our small town, for the most part they were giddy with anticipation. Everyone was in a celebratory state, and all of us who live here was ready for the event to come to fruition, with only a few hazy clouds forecast. 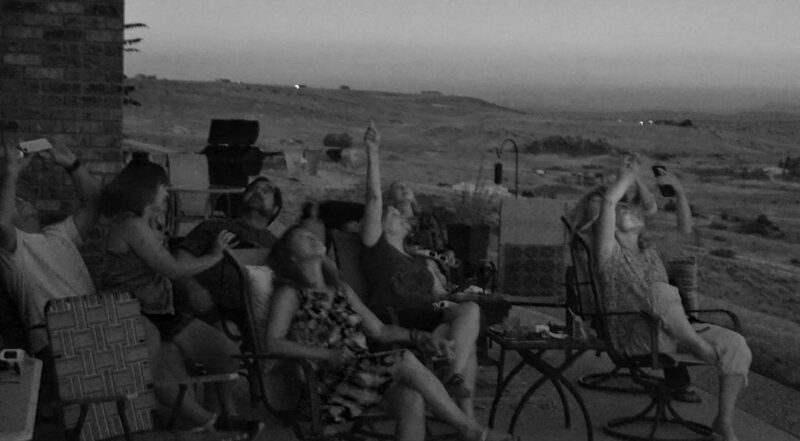 The morning of the Eclipse we were prepared,…snacks, drinks, and perched on a hilltop with a perfect view. Sporting our bedazzled eclipse glasses, we waited and watched. The partial was interesting, and worth watching no doubt, but then it all changed. When totality happened and we took off our glasses, whatever my small group thought it would be like, we were all wrong, It was so much more. I am not going to go in to any detail of the full-on experience, because there are no words I could muster that could even start to express how we felt. I will say it was bonding. We shared something in that moment that made you feel so very small, but also part of something very, very big. Before the sun was shining fully we were discussing Eclipse Chasers. Actually we were discussing about becoming one. Eclipse Chasers,…Really!! !